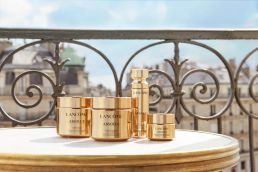 Discover Lancomes’ New Absolue Soft Cream range. Establish Absolue’s rose biotech expertise via Grand Rose extracts, the one legendary ingredient. The star cream Absolue Soft cream features a cutting edge formula combining exceptional efficacy and ultimate sensoriality: the TTT texture. The entire range in a new premium packaging. A modern renovation with refills demonstrating luxury with conscience.